250ml BUMPER BOTTLE for the serious shooter. We were asked by .50BMG shooters if we could supply a larger size bottle of C2R so here it is in a bumper 250ml container. This is the 250ml container with child proof cap plus a free application spout, perfect for your reloading room. This product is UK produced specifically for the UK and European market and we believe it is currently the best in the market when it comes to stripping copper plus it has the added bonus of removing carbon as well. C2R is a water soluble ammonia free product that will not harm rifle barrels or finishes, what it does do is clean your barrel without the need for bore brushes, just use patches soaked in C2R and finish off with water soaked patches followed by a light gun oil if required. 1. Wet a patch on a jag (or a mop) with C2R and push it through the bore from the chamber side till half of the patch / mop protrudes from the muzzle. 2. Pull jag/mop back slightly so it forms a small pocket and, holding the muzzle up, pour a small additional amount of C2R into the pocket. 3. Pull the rod back down the bore, coating the bore thoroughly. 4. Leave to soak for several minutes (10-30 minutes) or longer if required. 6. Repeat the process 1-4 (alternate with C2R and water until the patches come out clean). 7. Dry the bore / chamber with several dry patches and oil for storage. NOTE 1: C2R is very effective and works rapidly, place all brass / copper jags in water to neutralise after use. NOTE 2: C2R is clear and as a consequence shows the removal performance for the copper fouling (blue tint and patches) and carbon (black residue and streaks). NOTE 3: For heavily fouled barrels C2R can be left in the barrel for extended periods (up to 1 week, then refresh the C2R application for optimal speed), then water patched and repeat process 1-6. NOTE 4: Do not oil the barrel if the rifle will be used within a day or two. This eliminates the need for a fouling shot. 1. Do NOT mix C2R with Ammonia or any other bore cleaners. 2. Although elements of C2R are chemically related to and smells lightly of Ammonia it does NOT contain any Ammonia and will not react adversely with steel (of any composition). 3. C2R It is 100% safe to use on any stainless steel or blued finish. 4. C2R is water soluble. 5. Please note that C2R will not remove rust. 6. If any C2R spills onto a wooden polished stock immediately wipe off with a damp cloth. 7. In addition C2R does dislodge the adhesion of MOLY and LEAD to steel provided it is left in for 24 hours or more. 8. C2R is flammable (as are many chemicals). 1. 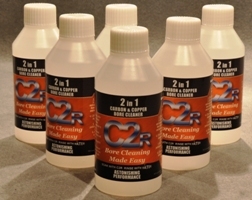 All C2R product residue can be removed by washing in running water and some soap. 2. As with all chemicals avoid any form of ingestion or aeration (inhalation), unduly long or excessive skin or eye contact. 3. The product is not unduly hazardous but prolonged direct skin exposure is not recommended. 4. In the very unlikely event that your skin acts adversely (itch, rash etc). when touched by the C2R product it is suggested that you stop all contact and wash carefully.